Digital transformation has uncovered the true value of Enterprise Architecture. What value proposition does Enterprise Architecture provide? 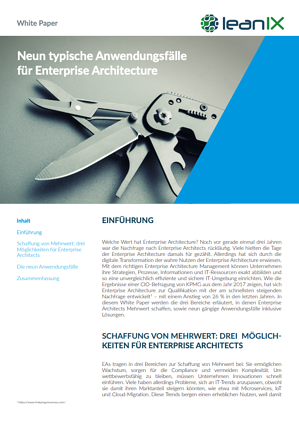 Just three short years ago, the demand for Enterprise Architects was on the decline. Recently, reports show that Enterprise Architecture has become the fastest growing, in-demand skill set in technology - up 26% from previous years. With correct Enterprise Architecture Management, organizations can build a holistic view of their strategy, processes, information, and IT assets to support the most efficient and secure IT environment. This white paper will explain the three areas where Enterprise Architects add value, and the nine commonly solved use cases.